Yes, they talked me into it, I do tarot reading by phone now. It did not occur to me that Tarot Readings would mean so much to people. I have been doing tarot readings for decades, but never just as a stand alone service. I would do them for clients I had worked with that needed a concrete plan of action to move forward with something. Every reading is different, and I love how you can get a card and in one reading it means one thing and it can mean something else in the next one. I really do love it. Tarot cards spark my already deeply intuitive mind. They allow a formulation to bring spirit’s desire for a soul clearly to the physical reality and provide absolute answers that without the cards would take longer to crystalize into a cohesive experience. For a deeper reading, I throw the cards ahead of time and sit with them for a while to really go deeply into the information being offered. So a very determined client (the lovely Luanne) who loves the readings I do for her, talked me into offering Tarot reading to those people who might just want a tarot reading. It is a good introduction to a long and honored method of divination. The cards I work with are based on sacred geometry. 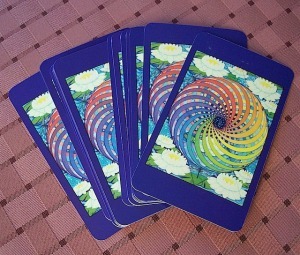 I have tried other decks – multiple other decks, but I find that the sacred geometry opens me to the understandings more deeply and quickly than any other set of cards I have ever worked with. My favorite part of receiving a reading from someone else, is to see how their cards look. Tarot readers in general do not change cards often. Their decks get old and used and worn. You see so much when you see a deck of tarot cards which have been loved and used in service. So, if you are interested in Tarot and symbology, Schedule a tarot card reading for yourself or for a friend.